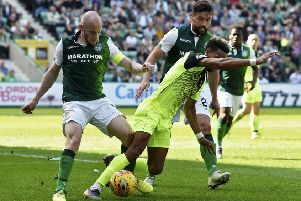 Jubilant Darren McGregor today claimed Hibs can go all the way in the Scottish Cup after enjoying the “best night of his career” as the Easter Road side made Capital rivals Hearts their fourth Premiership victims of the season. A Jason Cummings goal, his 20th of the season, just four minutes into the fifth-round replay sent Alan Stubbs’ side into a quarter-final tie with former Hibs boss John Hughes’ Inverness Caley, one which the striker will miss having been sent off along with Hearts Blazej Augustyn, the pair having both picked up needless second yellow cards within minutes of each other. But while admitting the Highland outfit will present another formidable hurdle, lifelong Hibs fan McGregor insisted the form book suggested a second trip to Hampden could await a side already in the final of the League Cup. “The games we have played this season will tell you we can,” said the 30-year-old. “We have already beaten Aberdeen, Dundee United, St Johnstone and now Hearts as well. So that tells you we can do it. McGregor, however, admitted the final five minutes of last night’s match as Robbie Neilson’s players threw everything forward in a desperate bid for an equaliser to send the game into extra-time were probably the most nerve-wracking of his career. However, hearing the home fans in a near 20,000 crowd belting out Sunshine on Leith after the final whistle was, he revealed, probably his best memory in football. He said: “This is my number-one moment in football. I can’t think of anything that eclipses it. Maybe if we go on and do better in the cups, but right now it’s number one. And the fact only six years ago he was working in fashion store Xile selling clothes to Hibs players did, he insisted, make the night all the sweeter. He said: “I used to sell the Hibs players their G-Star jeans and Replay jeans so to be five years on in the team I supported all my life and beating their rivals in the Scottish Cup is a dream come true. “I am so grateful after everything I’ve been through with injuries to have been given this chance. “It’s well documented I’m a Hibs fans and to come away from a derby having won with Sunshine on Leith blaring across a packed stadium is just incredible. Head coach Stubbs agreed there were times when Hearts could have got the goal they were looking for, saying: “We knew they were going to pus us under pressure. They are a really good team, there’s no denying that. “But we have beaten the third best team in the country at the moment when you look at it that way. There were going to be times when we had to defend well and we certainly did that. Stubbs believed the two red cards spoiled the match, referee John Beaton also booking another seven players in an explosive clash, but he didn’t feel Cummings warranted his two bookings, the first for celebrating his fourth successive derby goal and the other, on the word of assistant referee Andrew McWilliam, for kicking the ball away. The Hibs boss said: “For the first one I don’t think Jason did anything wrong. He stayed on the pitch as you are meant to do and for the second I’m led to believe he didn’t kick the ball away.